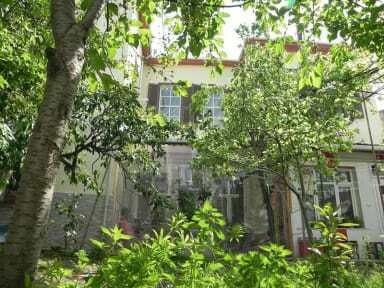 *We are right in the middle of the city, very very close to Basmane main train station... We have garden with many trees, flowers, a small fountain and a terrace which is very cool in hot summer days. The hostel building is a restored antique wooden building, build earlier then 1839. *We have a SHARED KİTCHEN, where there is a separate fridge for our guests. The kitchen as well has a quite big space and has a glass window in the ceiling. *We have bicycles for rent, as Izmir’s main areas are mostly flat and easy for cycling. Our reception hours is from 08:00 to 00:00 midnight. Feel free to contact us between these hours and you can always reserve a space via directly reaching us by phone or mail. We help our guest the best with traveling advice and help them with using transportation and buying plane-bus tickets. We are very close to the main attraction areas in Izmir, like Agora ruins (5 minutes walk), Kemeralti open Grand Bazaar area (5 minutes walk), Kultur Park (5 minutes walk), Kadife Kale Castle (25 minutes walk) and famous Clock Tower (15-20 minutes walking) And around the hostel, there are many small streets with old houses and local shopping street where you can view local life. Our rooms have 4 to 5 meter high ceiling and big windows which brings lots of sun light in. 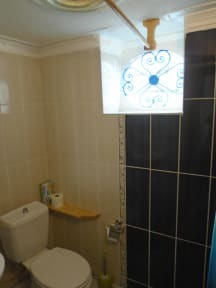 Free WiFi and 24 hours hot water are available. Our Cherry Room is a very big spacious room with a double bed and a single bed can be added. The room is 21 m2 and has a very high ceiling. The Rose Room is very big dorm room with a garden view. Every single bed has its own window, private curtain, electric socket and shelf. Everything was fantastic, great hospitality and vibesz definitely recommend staying there! It was an awesome stay. The hosts are really nice. We enjoyed it to the fullest. Very nice atmosphere, friendly and interesting people, easy to socialize if you want to. The chill-out area and the garden are both really beautiful. The only thing that could have been a little better is the hygiene of the bathrooms. All in all, I'd definitely stay there again! It was fun. Very nice atmosphere and an amazing staff! Great people, hope to see them again once. Great atmosphere and good value for the price. I would definitely stay here again when I go back to Izmir one day. I did like the stuff. They're really nice and let you feel welcome. Whole hostel is like a hippie commune which you should like when you stay here. They're no lockers so your private things aren't pretty save but you can give it to the stuff. The bunk beds are horrible but it's only for a few nights. You got a kitchen with lots of spices and herbs which is nice for travelers.